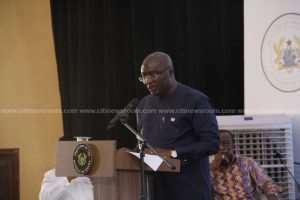 The Vice President, Dr. Mahamudu Bawumia has lamented the inability of the Ghana Grid Company Limited (GRIDCo) to operate at optimum level without plunging the country into total darkness. It says the company is struggling with transmission challenges as a result of obsolete distribution equipment. Explaining the recent power cuts at a town hall meeting on Wednesday, Dr. Bawumia insisted that Ghana is producing enough power but GRIDCO, the power distribution company, is unable to distribute it due to its old systems. Dr. Bawumia also disclosed that the country is currently paying an amount of $24 million per month for unused power under the agreement with the Independent Power Producers. He said there are fears that amount may double this year. The Energy Minister, John Peter Amewu, has apologized to Ghanaians for the recent blackouts in parts of the country. Although the Minister will not admit that the outages indicate the return of the most dreaded 'dumsor', he said plans are far advanced to resolve the energy challenges facing the country. Mr. Amewu assured the citizenry of relief soon saying the power situation will be normalized within the shortest possible period. The Minority has stated that the government has returned the country to an era of load-shedding popularly called “Dumsor”, a claim the Energy Minister has dismissed. Amewu has promised that the government has put the necessary measures in place to resolve the problem within 12 days. In light of the recent challenges, the Africa Centre for Energy Policy (ACEP) has asked the government to publish a load shedding time-table for the country. According to ACEP's analysis, the current power situation resembles the onset of the power crisis which bedevilled the country some four years ago. The Ghana Gas Company had assured that the power supply will be stabilised within the next two weeks.